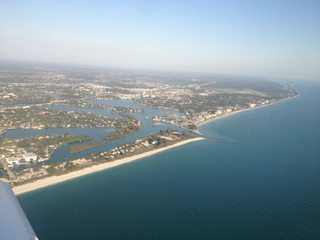 Venice is one of many beautiful Florida coastal towns, and one I often fly to. The town is located in Florida’s gulf coast between Sarasota and Ft. Myers and has a population of 21,000 (2010 census) many of which are snowbirds (people who live in Venice during the winter months). Its airport is unique in that it’s close to the beach and on approach to landing you get beautiful views of the Venice jetty and the houses facing Roberts bay. It’s a beautiful and quiet place to live. Our Venice customers usually charter our Cirrus SR22 for flights to and from Miami, Jacksonville, Boca Raton or Key West. If you’re flying in or out of Venice with us, we use the Suncoast Air Center, which is an excellent FBO with a large lobby, friendly staff, and easy ramp access to get to your airplane. You can walk from your car to your plane in about 1 minute, it’s so close. Passengers love the convenience. Plus there's a restaurant next to the lobby. I sometimes grab lunch there after a flight. The food and service are good and I recommend you try it. If you live or work near Venice, you’ve got a great general aviation airport at your disposal. Be sure to use it to save time, enjoy life and see the world.